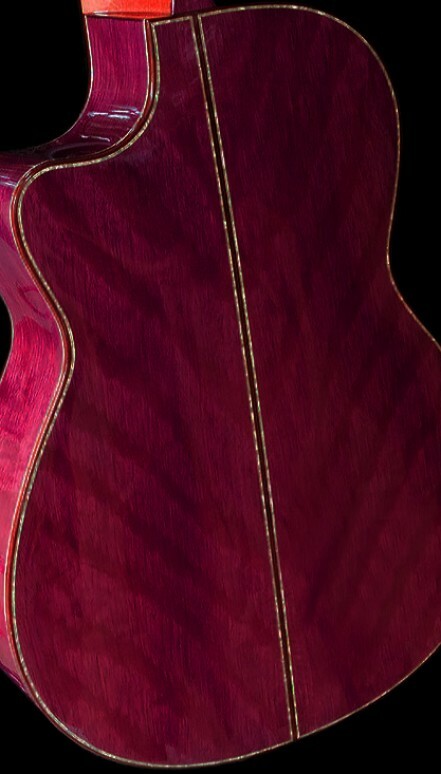 This amazing Purpleheart Concert Guitar is literally, "fresh out of lacquering". I tuned her up and, as I expected, I could hear a powerful and perfectly defined voice. Not only is she powerful, but her quality of sound is stunningly beautiful. 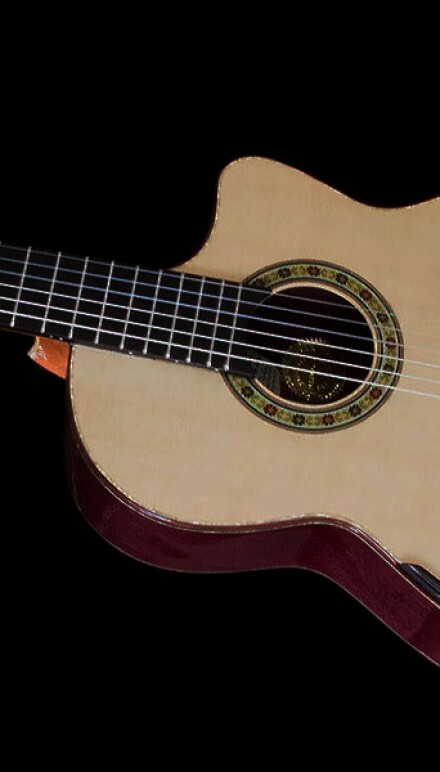 Add to this that she has a 630mm fingerboard and you will soon understand what she is one of the best guitars you could wish to play. 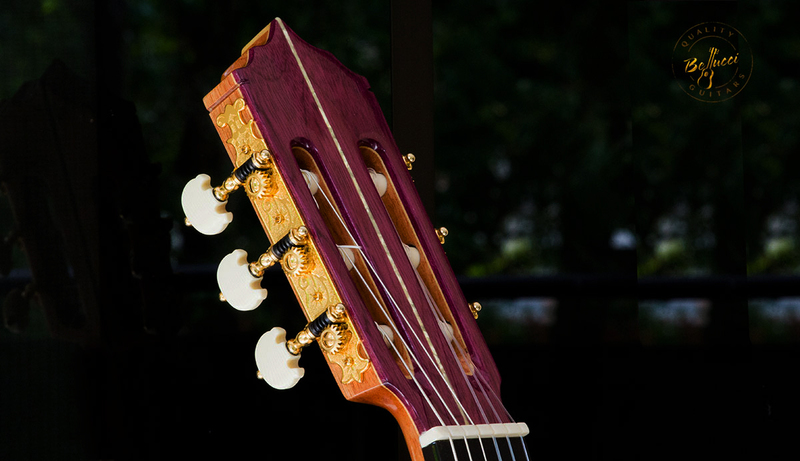 She has a punchy and profound bass that stands out immediately whilst the treble string is what I consider "the perfect treble string": Loud and sweet at the same time, qualities that seldom go together. As I play Romance I immediately feel the pouch in the bass that enhances each one of the musical phrases. The music gains in beauty as the different voices take their place and she starts showing her amazing capabilities in the separation of voices. 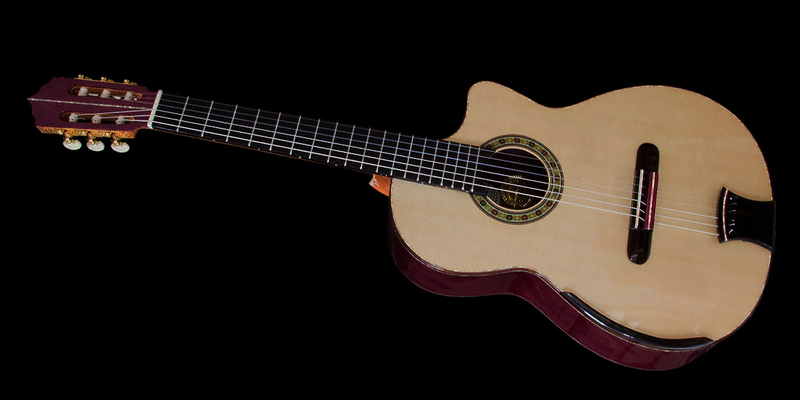 The clarity of the trebles is heavenly in Cavatina. As I am playing, I cannot believe how easy she feels in my hands. Naturally, the 630mm scale helps big time. 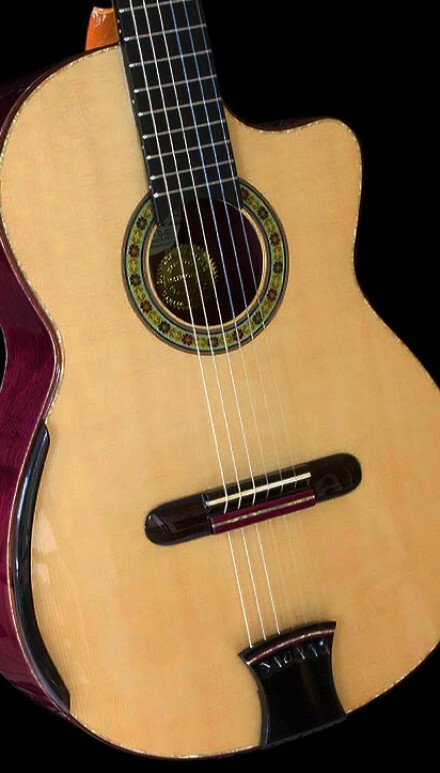 When you add to this tat she has a slim cedar neck and the exclusive Bellucci flying fingerboard and the complicity of the Ebony Violin Tie and the Ebony Armrest, you will finally unveil the secrets to the amazing sound that she can put out. 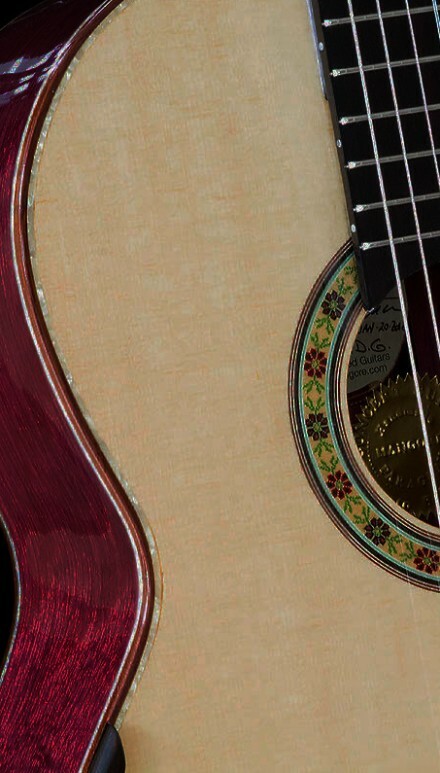 Pearl markers on 3, 5, 7, 9, 12, 15, 17 &19 will keep you oriented throughout your playing.The Italian Spruce top delivers the most amazing power and clarity and creates an amazing contrast of color against the deep purple of her body. Rosewood and pearl conglomerate linings was my choice to bring out her lines and accentuate the tie, bridge, and Rosewood bindings. I also used Purpleahert Burl to add some marvelous touches to the Ebony Violin Tie and Bridge. 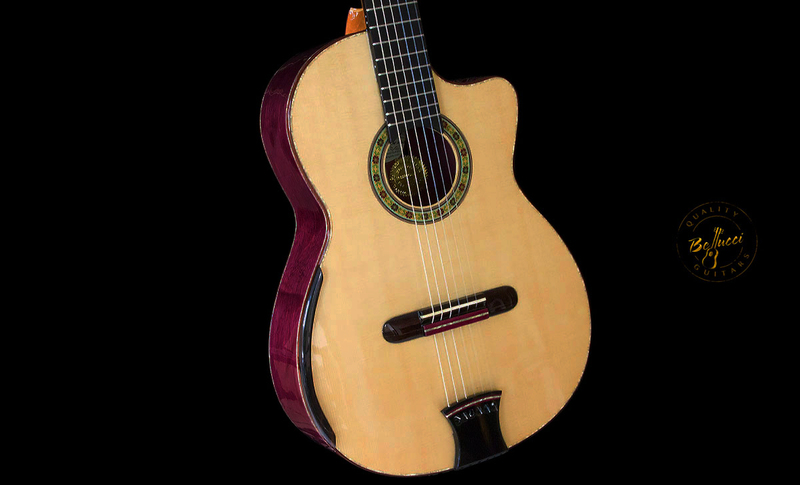 The Cutaway is again an element that adds beauty and amazing ease of play to the instrument and allows easy access up to the 19th fret thus covering all the frets on a classical guitar. 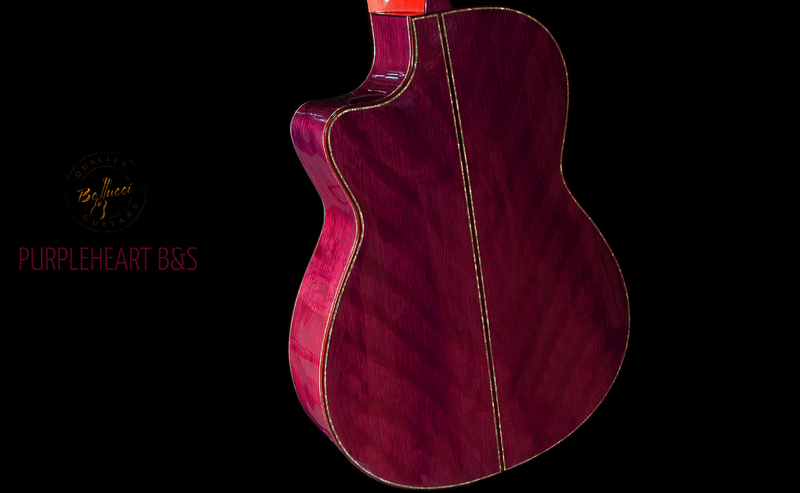 The beauty & playability on this Curly Purpleheart sets her apart from the rest and makes her one of the best Bellucci builds to date and definitely a great way to start this year of the Lord 2018. With the action at just 3mm and a slim neck, playing does not get much easier that this. 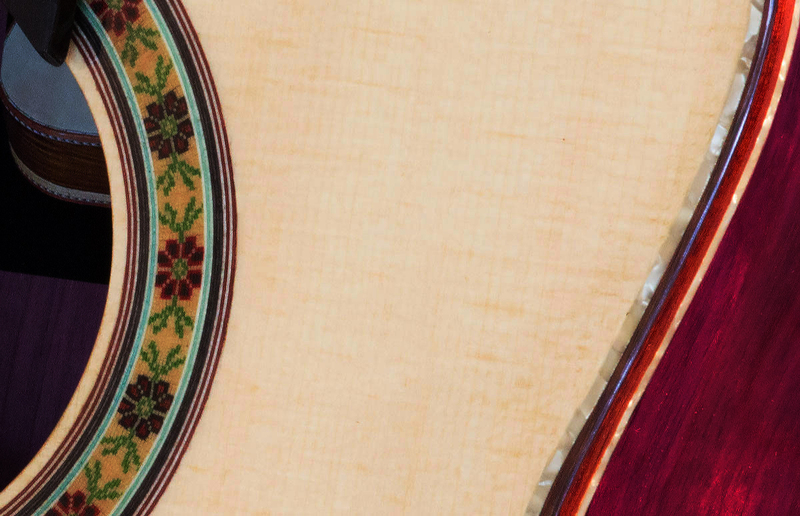 A stunning hand tooled Leather Hardshell is included, still, you can opt for a different case at checkout. 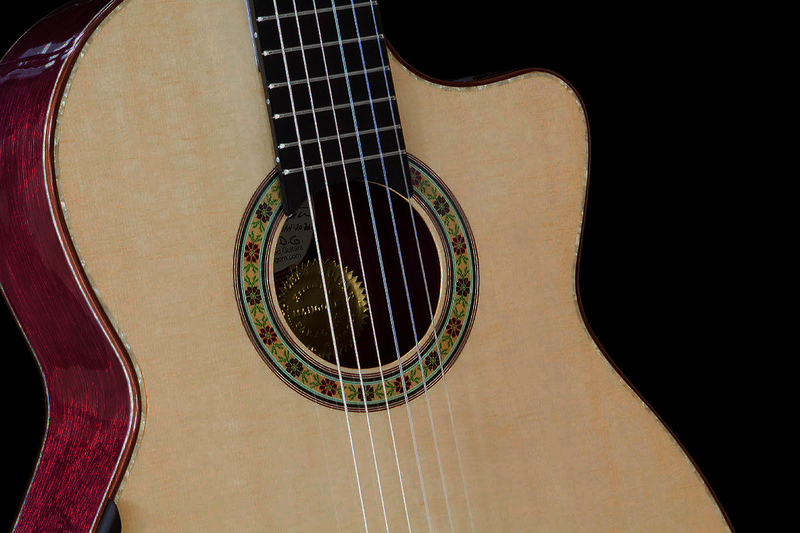 This Queen is the one guitar you do not want to miss. S.D.G. 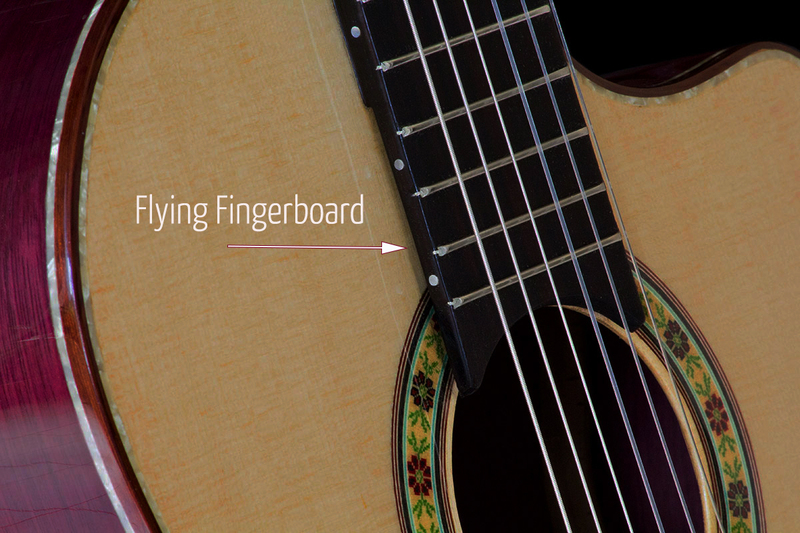 The fingerboard is only attached to the top so as to guarantee structural stability and resilience to the neck. 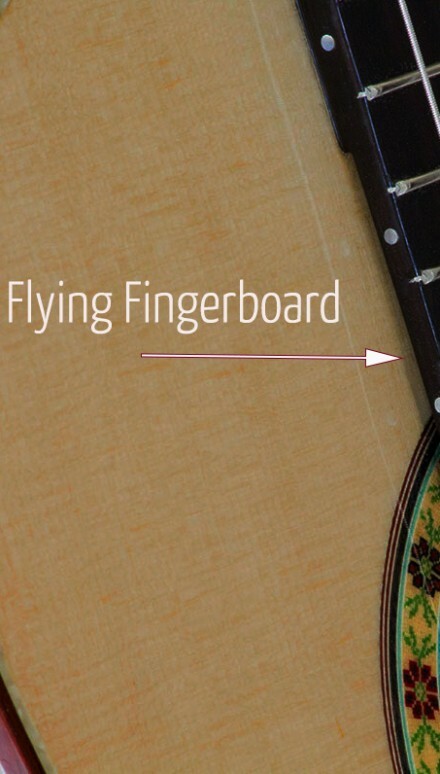 Approximately halfway between the contact point with the body and the soundhole, the fingerboard takes off and has no contact with the top of the guitar thus allowing the top to vibrate freely and produce more sound. 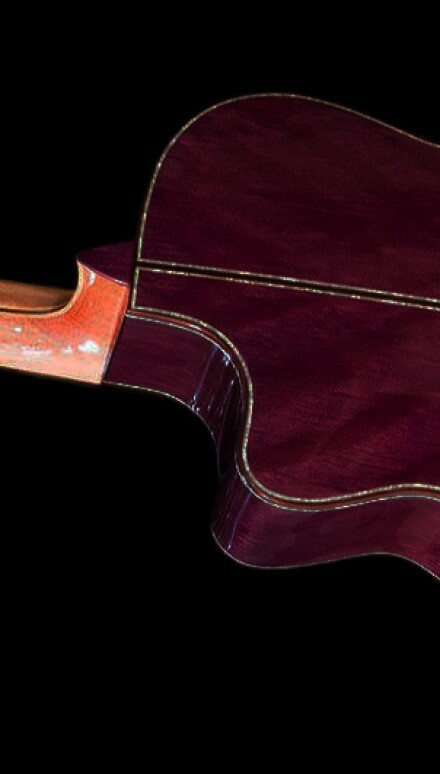 The construction technique of the Bellucci elevated fingerboard took a couple of years to perfect and is now one of the best Custom features of Bellucci guitars. The lattice is a concept based on the A frame of grand pianos. 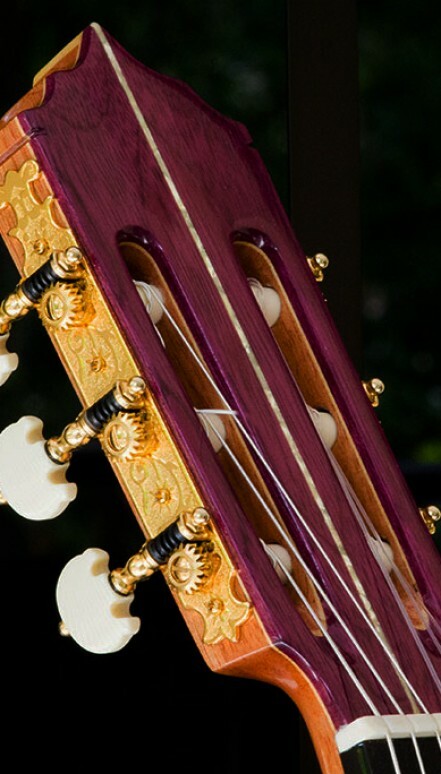 The back and sides are kept rigid by means of a sturdy A shaped frame and the top is thinned as much as possible to allow the top to vibrate generously. The thinned area is approximately 1.2 mm thick (Vs. 2-2.5 in the standard thinning techniques). Lattice delivers a lot of volume and wonderfully clear trebles.